Teachers led by Our City, Our Schools descended on City Council with evidence of the toxic conditions inside their schools on June 5, 2018. They are urging increased funding of schools. The group, including Central High School teacher George Bezanis, right, sporting a gas mask, hands a surgical mask to Councilman Bill Greenlee in Council Chambers. After a day of bargaining among themselves, Philadelphia City Council came up with a budget plan Tuesday that increases money for city schools in the coming years — but avoids Mayor Kenney's controversial proposal to raise property taxes. Lawmakers balked at the idea of another real-estate tax hike after being flooded with phone calls from constituents complaining about the 2019 property assessments — many of which resulted in automatic tax increases. "The simple reality is that in most people's minds in the City of Philadelphia, there was already a real estate tax increase," Council President Darrell L. Clarke said. "The issue with respect to increased assessments has essentially created to some degree a very, very challenging environment for members of Council." The decision by legislators to steer clear of a property-tax increase comes one year before they and Kenney are up for reelection — and if it holds could be seen as a political loss for a mayor who has traditionally enjoyed a lot of sway with Council members. $95 million in prison budget cuts over five years. Up to $93 million in new revenue over five years from increased delinquent tax collection. $340 million more over five years from a reduction in planned cuts to the wage tax that Kenney proposed and Council approved in committee last month. An extra $100 million grant from the city's general fund to the School District over five years. It is unclear whether Kenney will support the new funding package. Asked about it, Kenney spokeswoman Deana Gamble said, "We are still reviewing" it. Council had also previously given initial approval to increasing the real estate transfer tax to 4.278 percent and a higher homestead exemption of $40,000, which would be revenue-neutral. Kenney's proposed $4.7 billion budget for 2019 — unveiled in March — included a 4.1 percent property-tax rate increase. The tax hike, along with the increase in the real estate transfer tax and a slower reduction in the wage tax, were expected to generate an extra $770 million over five years for the School District. Several Council members had proposed alternate budget solutions, such as Councilwoman Cindy Bass' spending cuts that she said would total $670 million over five years and Councilman David Oh's similar proposal that would bring in $171 million in savings in one year. Councilman Allan Domb was also pushing to cut the prison budget by 15 percent and increase the city's delinquent tax collections. Ultimately, various proposals were combined into what was voted out of committee Tuesday and headed for a final vote next week, Clarke said. Such votes are usually pro forma, although there's always a chance for last-minute adjustments. "Funding the schools through savings — prisons, tax collections. That's something I've been saying for over a year," Domb said. "Sometimes in government it takes a little longer. … I'm happy." Councilman Mark Squilla represents South Philadelphia, one of the gentrifying areas that has been hit the hardest by the new assessments. "We heard a lot of the constituents and concerns from the property owners in the city of Philadelphia that the big, large assessment increase that happened really made it almost impossible to generate more revenue through a rate increase of the real estate taxes," he said. Council members were scurrying in and out of Clarke's office all day long Tuesday trying to hash out a deal behind closed doors. Clarke said there could be more changes to the budget in the next week or two: "There may be an additional action taken before we can conclude as it relates to support for schools." The School District's projected budget deficit over the next five years is about $630 million. However, the district won't be in the red until the third year of the plan. School District advocates were in City Hall Tuesday in full force calling for Council to pass a budget that properly funds the district's needs. "These graduates have been educated in a system without nurses, counselors, librarians or critical maintenance staff," said Toni Damon, the principal of Dobbins High School, of her graduating seniors. "I am counting on everyone here who cares about our children to work together to make sure that realities like this one are a thing of the past." Several Council members reassured those in the audience at a mid-afternoon press conference that in the end, they would come through for schools. "We're working out the math right now to make it all work out," Bass said. "But at the end of the day, Council is going to be where we need to be." In a dramatic show of their favored plan — ending the tax abatement — more than 50 Philadelphia teachers and education supporters later shut down the start of a Council hearing, chanting, "Fund our schools! Tax the rich!" 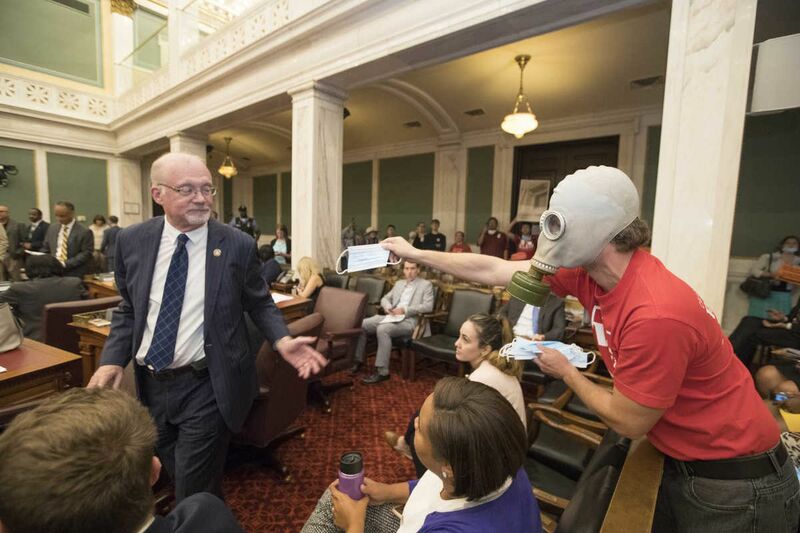 They donned hazmat suits, put fake rats on their shoulders, and handed masks to Council members to symbolize the poor conditions found in many city schools, documented in a recent Inquirer and Daily News series. The group protested for several minutes before being asked to leave by sheriff's deputies. Kenney's five-year and capital budget spending plans were also amended by Council on Tuesday afternoon. Those two bills plus Council's revised fiscal year 2019 budget are heading for a first reading during Thursday's Council meeting. Council's last meeting of the season is June 21. The budget is due June 30. Staff writers Kelly Brennan and Laura McCrystal contributed to this article.